An Official Look at Nike's Air Max 180 "Ocean Bliss/Metallic Silver"
From the “Fire and Ice” pack. After a first reveal via the “Fire and Ice” pack campaign, Nike‘s Air Max 180 “Ice” iteration – formally dubbed “Ocean Bliss/Metallic Silver” — has now debuted with official imagery. The nature-inspired Air Max 180 features a leather and mesh upper in an icy color palette of light aqua and ocean blue. The sole unit continues the blue theme with color block formation, a semi-transparent outsole and an off-white midsole. Highlight elements include a cartoon mascot of an ice cube wearing a beanie on the tongue tab, a black thermometer graphic at the heel and a silver 3M reflective Swoosh at the side. 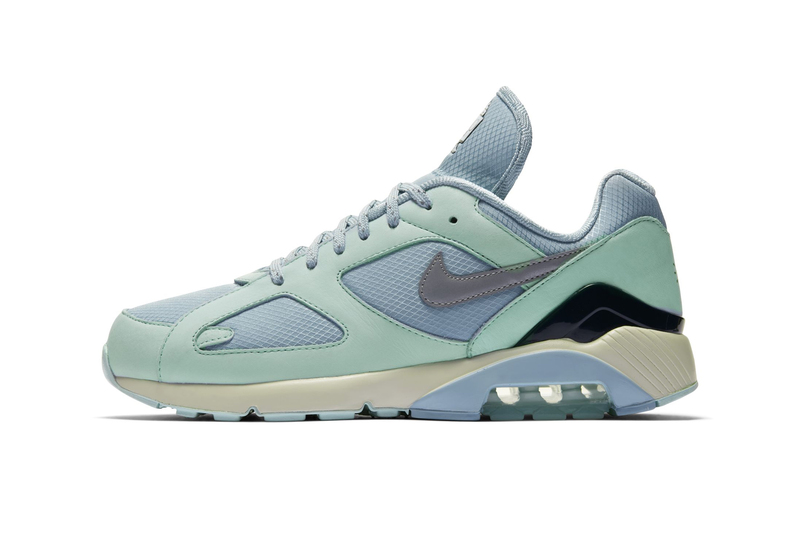 You can pick up the Nike Air Max 180 “Ocean Bliss/Metallic Silver” now for €140 EUR (approximately $162 USD) at 43einhalb now. Nike Is Bringing Back the Shox R4 in "Metallic Silver/Comet Red"
COMME des GARÇONS Play x Converse Chuck Taylor Releases in "Polka Dot"